Push lists down the eight showbiz moms who are quite entrenched in their children's careers and personal lives. These moms may be celebrities in their own right, but everything else takes a back seat to their role as mothers. They may have different ways of parenting and different ways of showing their love, but in everything they do, their children’s best are definitely top of mind. The mother-daughter tandem of Mommy Min and Kathryn Bernardo is a typical sight during tapings and other showbiz gigs. Mommy Min supports her youngest daughter fully. “She told me, even when I was a kid until now, that I should always give my 100% best,” Kathryn shares. Mommy Min is Kathryn Bernardo’s person. To other teens, Kathryn advises, “Be open to your mom. Kasi pag nagtatago ka, for sure, nararamdaman niya 'yan. Dati nahihiya akong mag-open up, but now feeling ko safe ako and hindi niya ako ija-judge." 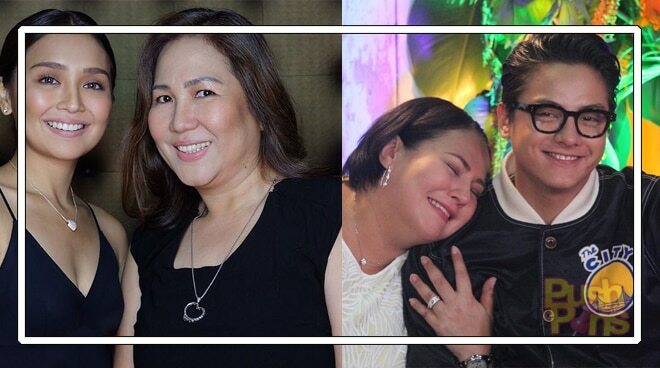 The two are so close, in fact, that Mommy Min has the inside story even on her relationship with her daughter’s on screen partner Daniel Padilla. “Mature na silang dalawa. Sa akin, it doesn't matter kung 18, less than 18, more than 18, as long as lumugar ka. Hindi naman na-ge-gauge ‘yun kung matanda o bata kung kayo na, ‘yung ganun. Okay naman sila. Lalo na kung nag-ma-mature mas okay di ba kesa kung mas bata bata,” says Mommy Min. Sarah G’s mom, Mommy Divine, has often been critiqued as being too involved in her daughter’s career to the point of overprotectiveness. But what is controlling for some, is simple protectiveness from her end. In an interview, Mommy Divine says that “nakikita kong iba siya sa mga kaedad niya na talagang exposed, na alam na nila kung paano paikot-ikot, kung paano sumuong sa ganoong relasyon at kung paano lumabas. 'Yong anak ko, hindi eh." Her daughter is her priority, after all, and her welfare is something she was not willing to leave up to chance. While she has allowed her youngest son, Bimby, some amount of exposure to media, she remains protective of how he is treated. "Kailan ba ko naglalabas ng galit? Kapag mga anak ko na ang ginagamit at pinagmumukhang may mali sa kin bilang ina. Karangalan kong sampal-sampalin ng mga salita sa ngalan ng pakikipaglaban para sa mga anak ko," Kris said. "Dahil sabihin nyo na ang lahat BUT MY SONS ARE LIVING PROOF that they are being raised with the love of a warrior queen." While Janella was said to have moved out of their home, she prefers not to divulge anything more. “Sana people talking about it will just respect my privacy,” requests Janella. Prior to their rift, mother and daughter were often seen together. Jenine appeared quite supportive of Janella’s career. At the end of the day, both still hope to reconcile and regain their relationship. Whether or not people agree with how she’s going about things, Jenine maintains that she only has her daughter’s welfare in mind. “Lahat ng magulang gusto mapunta ang anak nila sa makakabuti sa kanila,” she tweeted. Carmina started acting at a young age, and understands the pros and cons of it. Her twins, Mavy and Cassy, are no strangers to the world of showbiz as well. In fact, they have been in the public eye for as long as they could remember, mostly through their endorsements, TVCs and brief guestings. Surprisingly, both remain grounded and have managed to maintain a healthy private life, thanks to their parents. Carmina shares that both she and Zoren are open to their kids joining the industry, but for now, that possibility has to take a back seat to their studies. Known for being a colorful character due to her fearlessness and bluntness, Annabelle Rama also serves as a manager for her six children, three of which are active in the business. While she never confessed to being a stage mother, Annabelle is obviously one with the way she defends and often outwardly gives unsolicited advice to her kids especially for her unica hija Ruffa Gutierrez. The two had a major rift in 2015 and Ruffa’s siblings said they are used to their mom and ate’s bickering. Eddie Gutierrez, the patriarch of the showbiz family even has this to say on their constant disagreements, "Pareho silang tama, gusto lang ni Annabelle bilang nanay ang the best para sa mga anak niya at si Ruffa naman, nasa edad na to choose her own life." However, despite their misunderstandings, Anabelle admittedly said in one of her interviews that she can’t bear losing any of their children, especially Ruffa. “As a mother kasi, doon mo mare-realize na maski hate na hate mo siya at lagi kayong nag-aaway, mare-realize mo na kapag nawala pala siya, iba ang feeling mo,” she said.